It is springtime on campus. The flowers are blooming all around the grounds, the trees are sprouting their buds filled with bright and beautiful color, and students are spending time in the sun playing guitar on the grass and hanging out. It is a quiet and peaceful sight. After the chill of winter, all of nature seems to be coming open in a new and beautiful way, but a familiar way as well. Spring is encountered every year but differently after every passing winter. The whole world moves through the seasons, from growth, to life, to aging, then to death only to come to life again. This coming to life again awakens man. It ought to make him slow down a little and take in the beauty of the world around him. He ought to carry this beauty with him responding to it. But he also must to remember that one day he will die and no longer experience this beauty. This is reflected in the seasons of the earth, but also in the movement of the Church throughout the year. In the liturgical calendar we begin every year in a moment of fasting and preparation, recalling that without Christ coming to earth we are doomed to death due to sin. We celebrate his coming at Christmas time and then we have time to reflect upon his coming in the form of a child and to grow in light of it during ordinary. Then we enter another period of fasting where we reflect upon and prepare ourselves for the great sacrifice Christ made for us on the cross, conquering death and saving mankind. We move through the trials of this Lenten season to the death of Christ but always in hope of the resurrection. With unfailing hope, in a manner of three days of his death on Good Friday through Easter Sunday we are able to celebrate Christ’s Resurrection. Our time spent in darkness is awakened by the light of His redemption. The material and the spiritual realms of the human person go through periods of life and death. Man participates in both of these in several different ways. The first way is like the seasons. He sleeps and wakes himself in his own life day after day moving through the changes of the world. It is through the sleep of the seasons that man becomes awakened a little more to himself and to the world around him. For the seasons move and shake people out of their comfortable and familiar environment into a different state. The changing in seasons can cause man to reflect on how he has been living his life by bringing up the way that he needs to die to his old ways and be reborn to a new more awakened life. In a similar way, when man moves through the liturgical year he is in a darkness, much like sleep, waiting patiently and vigilantly to be brought back into the light. For the liturgical year begins in a time of fasting and patient vigilance and moves into celebration. Afterwards it then moves to a period of growth and continuation in light of what has been celebrated and remembered. 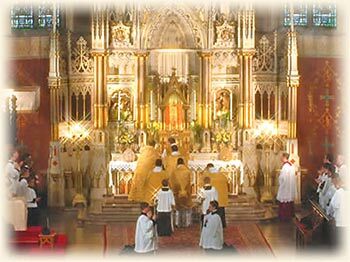 In Liturgy and Personality, Hildebrand claims that “The unfolding of the Liturgical year as a whole is also an expression of awakenedness and vigilance.”(1) Man is not meant to haphazardly go through this life in a sleeping daze. Man is meant to be awake, to live, to feel, and to respond, not only to the joys and beauties of the seasons like spring and Easter, but through the pains of seasons like winter and Lent that require us to patiently but still joyfully wait, live, feel, and respond. Let us look at what Hildebrand says in Liturgy and Personality by the movements of the Liturgical seasons, “The worst form of slumbering, of bluntness, is to be absorbed in our business of life that we do not even long for God anymore.” This movement allows us to be shaken out of our casual everyday routine and brought us back into focus where we long for God. Therefore, let us look at the seasons as an example of the redemption of suffering. We would never be able to appreciate the joy of summer unless we endure the bitter winter. In the same way, if we always had Easter, we would not be able to rejoice as much and as totally if there was no suffering of Lent. The liturgical seasons, working almost hand in hand with the seasons of the world, awaken man out of a slumber and bluntness and bring him to confront the sufferings and triumphs of the cross. Man is not meant to float through this life in a slumber of bluntness, leading a life that lacks all flavor. Man is meant to live a life full of flavor, to be awake, and to move closer and closer to God in all that he does. (1) Dietrich von Hildebrand, Liturgy and Personality (Baltimore: Helicon Press, 1960) page 79.